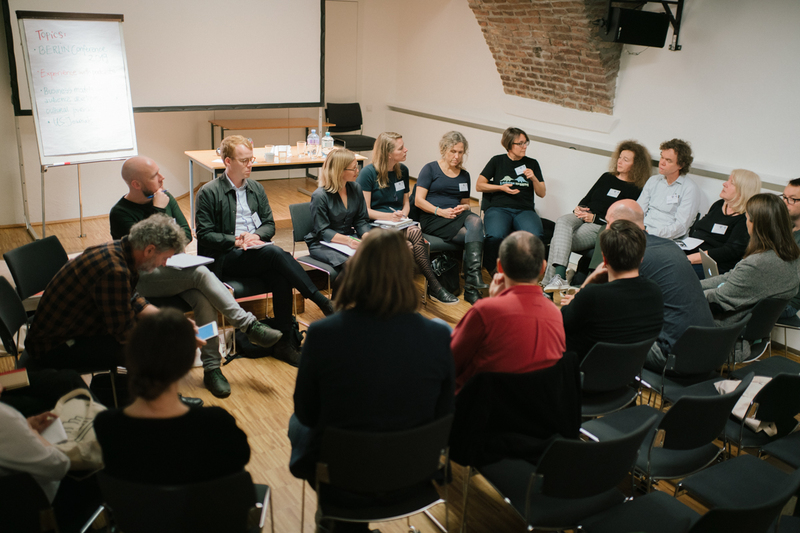 The Eurozine Online workshop “Strategies for cultural journals today” brought together 10 participants, including editors from Austria, the Netherlands, Poland, Romania, the US and Norway on 29 November 2018 via the webinar platform Zoom. The webinar was organised with and moderated by Miriam Rasch, researcher at the Institute of Network Cultures in the Netherlands. Cultural journalism and publishing the post-digital era is one of the Institute’s research foci. The webinar took the Dutch landscape of cultural journals as a starting point and focused on strategies for cultural journals, taking into account a triangle of three interdependent priorities relevant to all journals: 1) Quality (of content), 2) revenues (business models) and 3) (diverse) readership (audience development). Miriam Rasch presented several best practices and examples of current projects and trends, which were then discussed with the participants, who shared their own professional experiences. Form coalitions and seek collaboration with other journals to exchange know-how and create synergies. In addition to Eurozine, another example of successful collaboration is Folio, the Belgian network of Flemish journals, linking up 35 member journals. Folio actively lobbies for the cultural journals sector on the national level, which would not be possible for single journals on that scale. Ad-hoc examples included a successful coalition of journals with the aim to raise funds for a set of essays that was then published collectively. Insight: For smaller, regional coalitions, communication is easier to manage than larger-scale networks, including in-person meetings. Example by a participant from the US: Public debates are organised together with other cultural journals and publications to share and expand audiences. Challenge: How to form coalitions in case of media landscapes that are strongly fragmented in regards to audiences and publications? The new approach to audiences is to understand them as “communities”, instead of “readers”, thus focusing on their active involvement and engagement, instead of passive recipients of content. This aspect is both linked to revenue (community-based revenue models such as crowdfunding) and quality (how to increase content quality through engagement). Best practices include events, offline gatherings such as reading groups, where journals can meet readers and vice versa. Community building efforts perform better if they are based on a genuine interest in the readers, and not take the aim to create revenue as their starting point. Input from audiences needs to be taken seriously, for example by inviting readers to submit article contributions or by asking readers for topics that they would like to see covered. Insight: Important to lower the barriers of participation, at the same time, be aware that it requires a lot of work on the publications’ side to work with communities. For example, a one-click poll on social media might drive engagement, but makes sense only if the outcomes then inform and influence additional activities. Example of lowering barriers: One participant found that longer official-looking letters asking for feedback intimidated readers, but shorter forms and additional incentives, e.g. a free issue, were more successful. Social media can be very useful for community building. One issue brought up by the participants was the challenge to set the right “tone” on twitter, Facebook etc. A strategy that is used by several journals is to use a more formal style on the journal’s official account and then further disseminate the posts via editors’ individual accounts that use a more personal, informal language, to “add colour and flavour”. One participant found that a more witty, playful tone proved to perform better also in the journal’s newsletters. Example for an editorial strategy that makes use of reader’s engagement: Generally, a journals’ issue can be set up in a way that it reads like a flowing conversation of articles. Letters from the readers to the editors can be used to include readers’ perspectives into this conversation. Main challenge: This is a demanding format, much work needed on the side of the editors to ensure participation. Podcasts can be a good way to expand a journals’ audience and build a community. Challenge: How to make sure the community is not a “filter bubble”, an “echo chamber”, but instead open and diverse? In past years, there was a tendency to publish shorter, more accessible articles as they were considered more adequate for today’s fast, digital media. This resulted in superficial, “bullet-point”-style writing. Currently, many publications put their focus on in-depth, long-form content, zooming in on certain topics and presenting unique viewpoints. Editorial choices are done carefully, and the complex editorial process is communicated to readers. Also, investigative journalism is becoming more important and appreciated again. Example: Vrij Nederland publishes a “top-1 list of books” recommending 1 selected book.